The temple at Ba’albek is famous for its extraordinarily large foundation stones (The largest in the world). These stones also qualify as the largest cut-stones in the history of mankind. There is no contemporary testimony for the construction, which dates back at least to Phoenician times. We can conclude that the name Baalbek means ‘The city/town of the Sun’. The Beqqa valley sits at 1150m above sea level and was recently occupied by armed forces (2004). While Lebanon is mentioned in the bible for its cedar-wood, it is perhaps curious that the Ba’albek temple was not also mentioned. (except perhaps as Solomon’s temple in Lebanon). 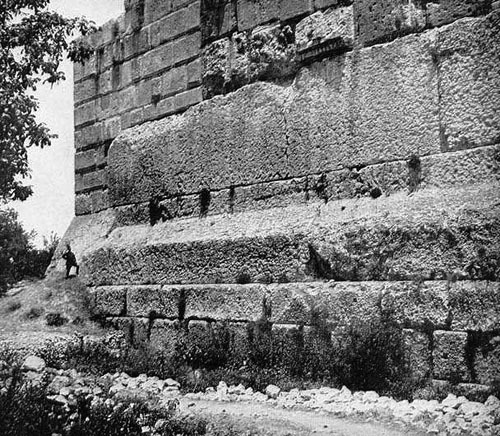 The stones used for the construction of the temple platform at Baalbek stand on record as the largest known quarried, cut-stones in prehistory (Three of which are regularly estimated at 800 – 1,200 tons each). The existing foundations of the temple were built over by the Romans, who dedicated it the temple to Jupiter. The origins of the site and the first builders are lost to us. However, it is often generally accepted that the foundations of the temple were constructed by the Phoenicians (1),(2). The photo (left) of the western wall of the ‘Temple of Jupiter’, shows the layers of foundation stones which were brought to light when the Arabs dug out moats around the edifice. The basement of the terrace is seen to be supported by six immense stones measuring 33 ft long each and 14ft high (right of the person in photo). These stones hold the weight of the three giant stones (the so called Trilithon), which were intended to support the last row, that should have been the higher edge of the terrace, but was never built. The similarity between the ‘cyclopean’ masonry in the foundations of the temple and the unfinished block (in the quarry) suggests that the stone in the quarry (see below), was cut in the earliest stages of the temples development. The early date of the temple foundations and the advanced skills of the masons reveals the presence of an unknown page of history as the only two ancient cultures in the middle-east with monoliths anywhere near this size were at Giza in Egypt and Jerusalem in Israel. The photo above illustrates how the three large stones (Trilithon), rest upon six other smaller stones (each of which has an estimated weight of around 400 tons). Estimate for the total weight of the nine stones in western wall. Total for all 9 stones = 4,800 tons. The temple is cardinally aligned and opens to face the east, which Lockyer concluded to be a result of deliberate orientation to the equinoctial sunrise (2). This information conforms to the fact that the temple was originally named ‘The city of the Sun’ by the Phoenicians in dedication to the sun-god Ba’al, and again later by the Greeks, who dedicated the temple to Apollo (Their sun god), and called it Heliopolis. The proximity of the granite quarry to the temple appears at first glance to explain the location of the temple, however, other ancient sites such as Giza or Stonehenge (etc, etc), were located up to 500 Km distant from the nearest source of granite, and it has been shown that the temple at Baalbek is aligned with other prominent ancient sites, which opens the possibility that the determination of the site may also have been realized according to geodetic principles. The temple was called ‘Heliopolis’ by the Greeks. The Egyptian Heliopolis near Giza is located almost exactly 5° west and 4° south of Ba’albek. As well as being cardinally aligned and composed of immense blocks, Ba’albek shares a geometric relationship with Giza, Egypt. As well as signifying the knowledge of a globe, (divided by 360°), this very specific separation of both longitudes and latitudes between the two sites has a secondary significance in that the angle created is (also almost exactly) 51° 51′, which is the same angle as that of the exterior faces of the great pyramid at Giza, a site invested with numerous geometric and astronomical proportions. The same ‘geodetic fingerprint’ can be seen at other significant Egyptian Temple complexes like Karnak (Thebes) and Giza, and appears to be related to the positioning of sacred places in the middle east and Europe from a geodetic center-point at Giza (or perhaps at Heliopolis). Although it is still in its infancy, the study of prehistoric geodesy is now being recognized as a serious scientific study both then and now. Arguably, the largest cut-stone in the World. 69 ft long, 16 ft wide and 10 ft high = 11040 ft³ or 20.9m x 4.8m x 3m = 300 m³. Estimated weight – 1,500 (1) – 2,000 Tons (Fix). The same is true of the three foundation blocks ‘The Trilithon‘, in the nearby Baalbek temple, which have the following dimensions: The largest is 65 feet in length, the second 64 ft 10 inches; and the third 63ft 2 inches. They are all 14 ft and 6 inches in height, and 12 feet in thickness. Each block is therefore 350 cubic yards and they are estimated to weigh 750 – 1,000 tons each (1). How was the stone moved – The ancient manipulation of such large stones is still a largely debated phenomena. Common to other similar ancient construction feats, there are no records to testify the means or date of this extraordinary achievement. However, the similarity to other extremely early middle-eastern masonry achievements, such as those seen at Giza or Abydos, in Egypt and the foundations of the ‘Temple of the mount’ in Jerusalem, have not gone un-noticed. Likewise, there appears to be a connection in the type of stone used, which was invariably quartzite (Red granite in the case of Baalbek). In the past such achievements were accredited to ‘The hand of God’, ‘Giants’ and more recently ‘Alien life’. However, we must be careful not to lose ourselves in disbelief. There is no doubt that these stones were moved, and as with most such unexplainable events, there is likely to be a rational answer if we look for it. For example, the Colossi of Memnon, in Egypt are both estimated to weigh 1000 tons each, and their movement is clearly depicted in hieroglyphs. Why was the stone moved – Just as important as understanding how they were moved, is the question of why such immense stones were moved. (Any increase in advantage gained by using large stones is balanced against the increased difficulties of moving them). In Egypt, for example, we can see numerous 85-ton stones that were moved over 500 km to their resting places in and around the great pyramid. The foundation stones for the Ba’albek temple were moved uphill to their resting place. The proximity of the quarry to the temple is close enough that it could be argued that the stones did not need to be moved, at least in terms of laying a foundation, as it would have been more effective to build the temple directly into the bedrock. This raises the question, why bother at all? While large stones are clearly structurally advantageous to a temple foundation, the extra-ordinary size of these suggest that another factor may have been involved in this choice of design. The idea that the temple was solar reasonably justifies the moving of the stones uphill, as placing the temple on top of the hill enabled it to capture the rays of the sun at the appropriate times of the year (the equinoxes). The choice of such large stones however, as with many ancient structures, might be better explained through the idea of a form of worship of the stone itself. Ba’albek: A gallery of Images. 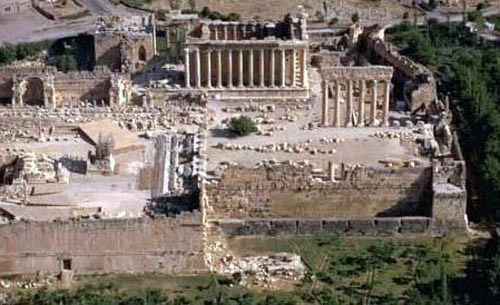 The Ba’albek temple complex from above. Sir. J. N. Lockyer. The Dawn of Astronomy. 1964. M.I.T. Press. R. Weaver. Monumenta Antiqua. 1840. J. B. Nichols and Sons Publ. A.F. Alford, ‘The Phoenix Solution’, 1998, Hodder & Stoughton. Worth Smith. Miracle of the Ages: The Great Pyramid. 1934. The Elizabeth Towne Co., Inc, USA. This entry was posted in Ancient Places and tagged Anunnaki, Baalbek on April 6, 2016 by ZSI.